Enjoy Berlin from a segway! It's the most fun way to explore Berlin, while learning about the German capital as you ride through in this historic city. In about 3 hours on our All-In-One City Segway Tour, we’ll show you all the main sights of Berlin, stopping every few hundred meters to soak them in, hear fascinating anecdotes, take pictures, and discuss Berlin’s history. Your knowledgeable native English-speaking guide will also explain present-day facts and lifestyle facets about Berlin while being available to answer your questions. You'll see and hear all about the Berlin Wall and wander through Checkpoint Charlie. Stand on top of Hitler’s bunker and see the Reichstag and hear about the burning that ultimately lead to Hitler’s rise to power. 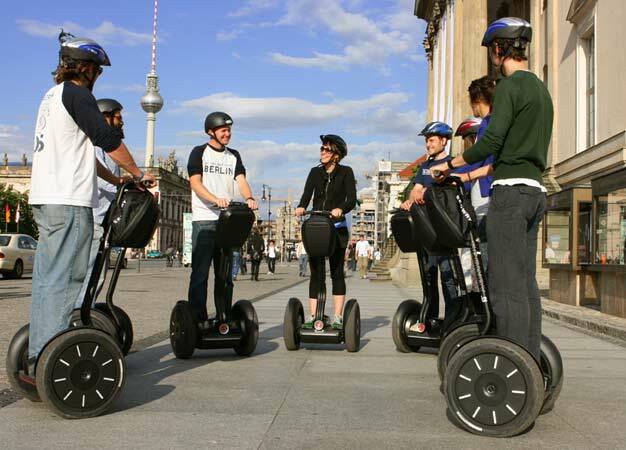 Along the Segway ride, you'll also see and hear about Brandenburg Tor, Marx & Engels Platz, Postdamer Platz, Unter den Linden, ‘the Death strip' that divided East and West Berlin, Berlin Statsoper and much, much more. Berlin Segway Tours starts at the TV Tower at Alexanderplatz. The tour ends back at the TV Tower. The tour lasts approx. 3 hours + 30 minutes of instructions. This segway tour is available in English only. Yes, you need to pay a deposit of EUR 200,- per booking (not per person) directly to the guide before tour start, either in cash or as a credit card deposit, and it will be refunded back to you at the end of the tour, providing your Segway hasn't sustained any damage. You should wear clothes according to the weather and flat footwear as a segway works better with flat shoes rather than with high heels. Participants must weigh between 100 lbs (45 kg) and 255 lbs (115 kg) to ride a segway. Do I need a drivers license to ride a segway? All participants must have a valid moped license or a driver license. I'm pregnant, can I ride a segway? Due to safety reason, pregnant women cannot participate on this tour. March 1 to March 31: Daily at 10:00am. April 1 to October 31: Daily at 10:00am and 2:00pm. Berlin City Segway Tour, TV Tower, Alexanderplatz, 10178 Berlin.